When I wrote the chapter in “The Devil’s Fire” which describes a pirate ship broadsiding a Spanish galleon in a tumultuous Caribbean sea at the height of the Golden Age of Piracy, I never expected I’d be able to experience such a thing. The latest Assassin’s Creed game has allowed me to do that, and a whole lot more. Assassin’s Creed IV: Black Flag gives the player free reign of the Caribbean, starting in 1715, when history’s most infamous pirates made their names. The seamless transition between sea and land is exhilarating. As you explore the Caribbean, you’re free to furl your ship’s sails and leap into the crystal blue waters and explore any island you happen across. The gameplay yields to the wants of the player, rather than the other way around. You can attack ships, hunt whales and sharks, explore mysterious coves and Mayan ruins, or wander an island town and engage in a tavern brawl. Black Flag stars Edward Kenway, a Welshman who has temporarily (he hopes) left his wife in order to pursue fortune in the Caribbean. He naively tells her he will be gone a year, two at the most. But Kenway’s plans change when he stumbles upon a Templar conspiracy. Those who are unfamiliar with previous Assassin’s Creed games, which have constructed quite a complicated mythology, need not worry. Black Flag continues the story but doesn’t require players to have a deep knowledge of prior games. While the same Templar conspiracy that propelled Assassin’s Creed 1, 2, and 3 also runs through Black Flag, the story is fairly easy to get a handle on. It may carry the title of a popular franchise, but this is a pirate game through and through. Edward Kenway’s story weaves conveniently in and out of history. He meets up with Edward “Blackbeard” Thatch (not Teach, in this telling), Benjamin Hornigold, Charles Vane, “Calico Jack” Rackham, and Anne Bonny, just to name a few. Kenway acts as a behind-the-scenes instigator, sparking key events in history but wisely remaining under the radar. When Woodes Rogers claims Nassau and turns out all pirates, Kenway helps Captain Vane set a ship on fire in the harbor as an act of defiance. The incident is just one of many that actually occurred. Hornigold’s surrender to Governor Rogers, which earned him the bile of his former compatriots, was particularly fun for me to watch, given Hornigold’s part in The Devil’s Fire series. Edward Thatch’s transition into Blackbeard is natural and surprisingly poignant. This is a slightly different interpretation of the man who would become the feared Devil of the Caribbean. He is not an overly cruel man who kills beyond necessity, but he plays up a frightful visage when it becomes clear that it will take him that much further. Black Flag does not brush over the details, including the large role that women played in piracy. Kenway has run-ins with Mary Read and Anne Bonny. Bonny is a fiery Irish lass who takes what she wants when she wants it. The graphics are stunning. The gorgeous Caribbean sea stretches for leagues, with beautiful, realistic water effects. Islands are green and lush, and the sandy beaches are white and inviting. The weather is unpredictable, and before you know it you might find your ship caught up in a violent storm, struggling to avoid dangerous funnels that stretch from the clouds to the sea. Rogue waves can be just as devastating as a frigate’s broadside. There are three major cities: Nassau, Kingston, and Havana. Liberties have been taken with the geography, but that is probably a necessary evil when making a game that is both fun to play and easy to navigate. In concurrence with history, Nassau changes drastically over the course of the game, beginning as nothing more than rundown shanties and evolving into a bustling town. A varied cast of talented voice actors bring every character to life. I particularly enjoyed Blackbeard and Bonny’s voice actors. The sound design is excellent, from the crashing of waves against your ship’s hull to the strange animal ambiance that accompanies nightfall in an island town or jungle setting. Brian Tyler’s (Watchmen) score is very cinematic, with a catchy main theme that I found myself humming when I wasn’t playing. While I’ve progressed through most of the story missions, I’m nowhere near done with it. I’ve got plenty more whales to kill, ships to broadside, forts to terrorize, shipwrecks to investigate, and islands to explore. 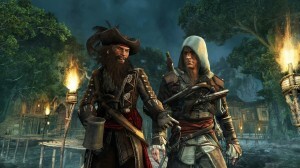 Assassin’s Creed IV: Black Flag is a must for anyone even remotely interested in pirates. This entry was posted in General, Reviews. Bookmark the permalink.